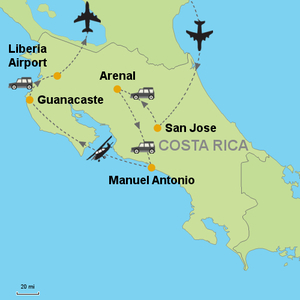 My journey to Costa Rica was a trip of a lifetime - and rightly so! Due to its exceptional geographic features: towering volcanoes, lush rain forests, and tropical beaches, it’s where endless opportunities for adventure await, and if you're like me and enjoy going off the beaten path, an eco-tour was the perfect way to spend the day. With over 100 national parks, reserves, and refuges – which make up about 25 percent of the country's land – I ventured into Rincon de la Vieja National Park, in the province of Guanacaste. One of the best ways to experience the spectacular natural world and learn about the efforts to preserve and protect this natural habitat is through a canopy tour via a zip line. Fitted with a seat harness and a pair of thick oversized gloves, my guide clipped my harness to a pulley, and I flew through the forest at close to forty miles an hour. As macaws squawked and white-faced capuchin monkeys foraged in the tree tops, toucans and howler monkeys roamed free as I soared over the forest canopy and allowed me to view the awe inspiring and pristine eco-system without leaving a footprint. It was truly an experience I would never forget. 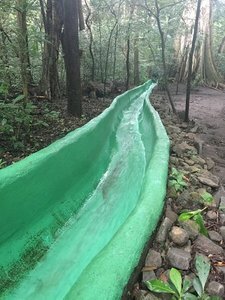 Something I didn’t expect to see in the rain forest was a water slide. Somewhat surreal, this crude, cement lined channel in the midst of flora and fauna, stuck out like a sore thumb. I was handed a helmet, an inner tube, and a flat leather mat. Instructions; place the mat on the bottom of the slide, put the tube on top of the mat, and then sit on the tube. (The leather mat ensured no one would scrape their bottom). Upon lifting a wooden door, water shot down the slide and like a carnival clown coming out of a cannon off I went. My screams lasted the entire 1,365 feet until I reached a small pool, where my ride ended…and it was so much fun, I decided to do it again! Traditional medicine has long held that Costa Rica’s hot springs hold healing and restorative properties. It’s source, nearby volcanos. With over 200 volcanic formations and five active volcanos, my next stop was at the foot of the Rincon de la Vieja volcano for a hot mud treatment, Costa Rica style. I spread volcanic mud liberally on my body from large steaming vats and then chose to soak neck-deep in a natural hot spring to wash it away. Delighted with the true sense of rejuvenation I concluded my day with a favorite phrase used by the Costa Ricans, “Pura Vida." Simply translated, it means “simple life” or “pure life”, but here in Costa Rica, it is more than just a saying — it is a way of life. 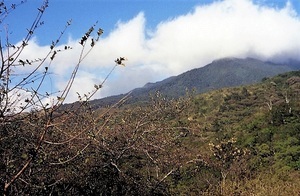 Tomorrow, to get a better understanding of the efforts being taken to protect this untamed land, I’ll be riding horseback at the base of a towering volcanic peak and hiking to a series of narrow suspension bridges and gorgeous waterfalls. Join me next month when I take an awesome walk with the hawks in Ireland!